Order a copy of Passage Across the Mersey today from Amazon.co.uk. When Helen Forrester’s father went bankrupt in the 1930’s, she and her six siblings fell from a comfortable middle-class existence into wretched poverty. Later in life, Helen wrote a ground-breaking series of memoirs, starting with Twopence to Cross the Mersey, which told the harrowing account of her family’s struggles in Depression-era Liverpool. She continued her memoirs with Liverpool Miss, By the Waters of Liverpool and Lime Street at Two which ends in 1945 when Helen was 26. It was a story filled with tragedy and small triumphs but many readers wondered what happened to Helen; what became of the fragile young girl who had so much responsibility heaped on her shoulders? Helen Forrester was an impeccable record keeper. She kept all incoming letters and carbon copies (or later printed copies) of her outgoing correspondence. Unfortunately several times during her life, when she moved, she purged much of her file material. Nevertheless when she passed away, she left more than two dozen large boxes of letters and speeches. These included all the letters from her most successful period as a writer and, very importantly, dozens of letters between her and her husband, Avadh, in the months before they were married. To write Passage Across the Mersey I reviewed thousands of Helen’s letters as well as many speeches and other writings. I then wove the book together using Helen’s own words wherever possible as well as other research and my own insights. The result is a sweeping narrative of Helen’s life spanning three continents and ninety eventful years. It was a fascinating process delving deep into family history and setting that against the tumult of the world in the twentieth century and early twenty-first. With the invaluable help of the Internet, I was able to add detail about people that Helen had encountered, the places she had worked and lived and the social conditions in which she found herself. Over the years numerous fans wanted to know more about her early life before the events of Twopence to Cross the Mersey started. Even more pleaded to know what happened after Lime Street at Two. 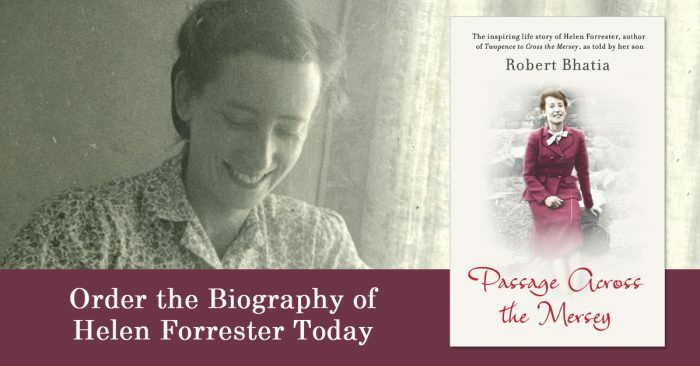 While her own four memoirs remain classics with rich detail about her life during the Depression and World War Two, Passage Across the Mersey tells her full life story. Fortunately, Helen had reminisced about her early childhood in letters to her sister and in speeches, including, remarkably, a fantastic speech to a high school audience in a small northern Alberta city. After she met my father and they had decided to get married, they were separated for several months during which time they wrote to each other almost every day. The result is a dramatic cross-cultural story spanning England and India and a wonderful insight into the early stage of a lifelong love affair. Helen’s life took her from England to India, to Scotland and then to Canada where she lived for over 50 years and achieved enormous success as a writer, especially in the United Kingdom. In writing Passage Across the Mersey I wanted to share the intensity and breadth of her life experience and some insights into how she became such a beloved author.